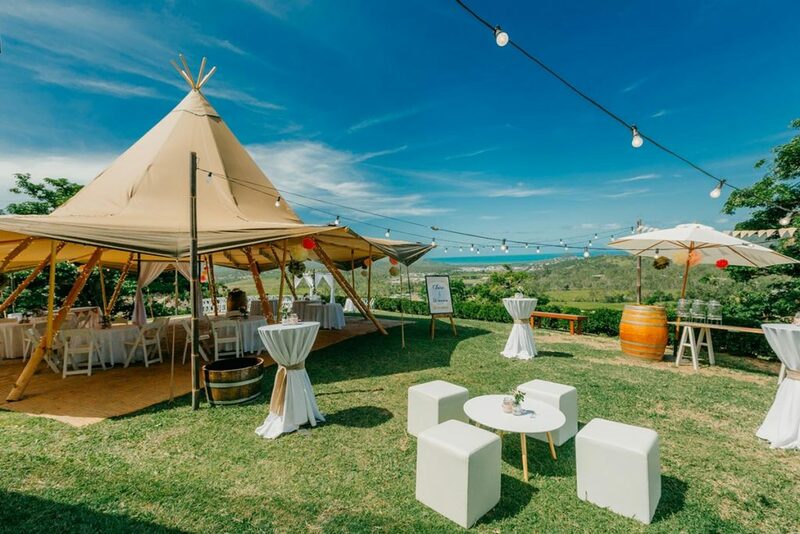 When embarking on your styling journey for your Whitsunday wedding you may feel overwhelmed with having to compete with the beauty of the region. 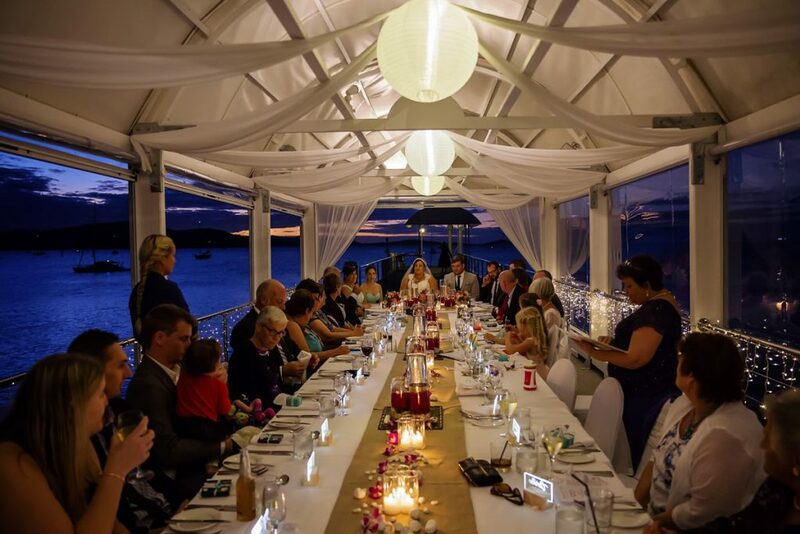 To help you make the most of our natural setting we have compiled a list with the help of Divine Weddings Whitsundays of everything you need to know to style your Whitsunday wedding reception. When choosing styling elements for your wedding reception, choose styling that not only looks beautiful and suits your theming requirements but also reflects and complements the venue and its surrounds in which you have chosen to entertain your guests. Waterside venues with lush lawns make for beautiful relaxed coastal receptions. 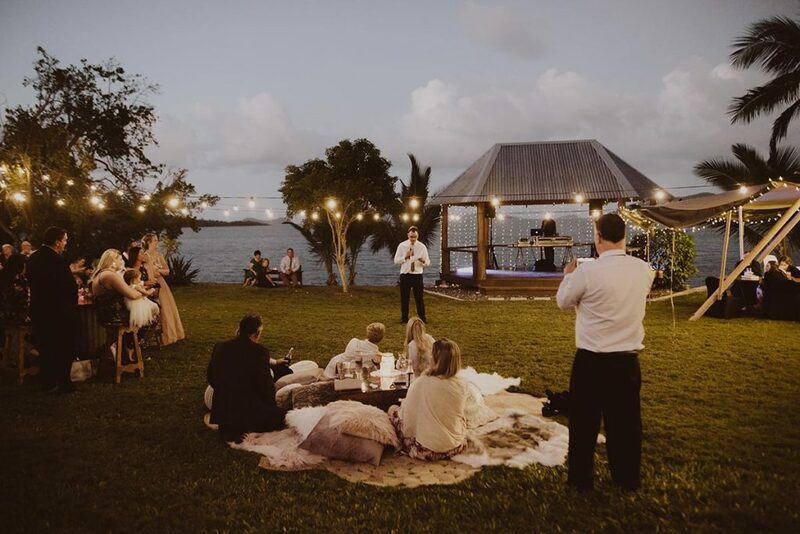 Waterside venues can be dressed up or dressed casually to create a wonderful outdoor wedding, which makes them popular for both informal and formal weddings. For décor styling at waterside venues a range of options and elements can be applied. The beauty of a waterside venue means you can keep it simple yet effective as the beauty of the surrounds do most of the scene setting for you. Sea breezes can hamper large displays so for table décor styling choose smaller lanterns or decorative pieces with simple florals and foliage, a solid heavier piece or low floral arrangements. Lighting is a key element at any reception venue. Ensure you have plenty of soft warm light. Lighting can instantly change the ambience of a venue and add that touch of romance. For indoor venues it is highly recommended to add warm lighting or lit features and soft textures to the room. Overhead LED lighting with flowing chiffons will add ambience and warmth. Even just adding a more detailed feature of LED string lighting without the chiffons can instantly transform the feel of the room. Too much light however can interfere with the formalities of the evening. If you are wanting a bright room for dining and a softer ambience for dancing, ensure that the venue lighting can be dimmed or partly switched off during the course of the evening once the dancing commences. For table styling, mirrors underneath your décor items can reflect light and enhance lit features giving a fuller sense of light and space. For outdoor and waterside venues choose a full overhead lighting display. 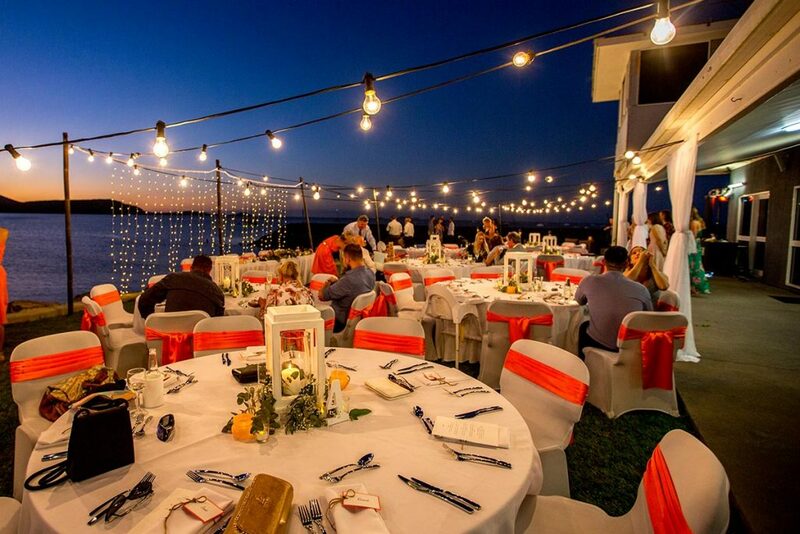 Whether it be festoon lights or LED string lighting, both instantly create an outdoor venue and entertainment area. LED string lighting can be enhanced with artificial ivy or foliage at outdoor venues to complement the surrounds. Hanging lanterns also add colour and depth, creating a fuller effect in the open air above. 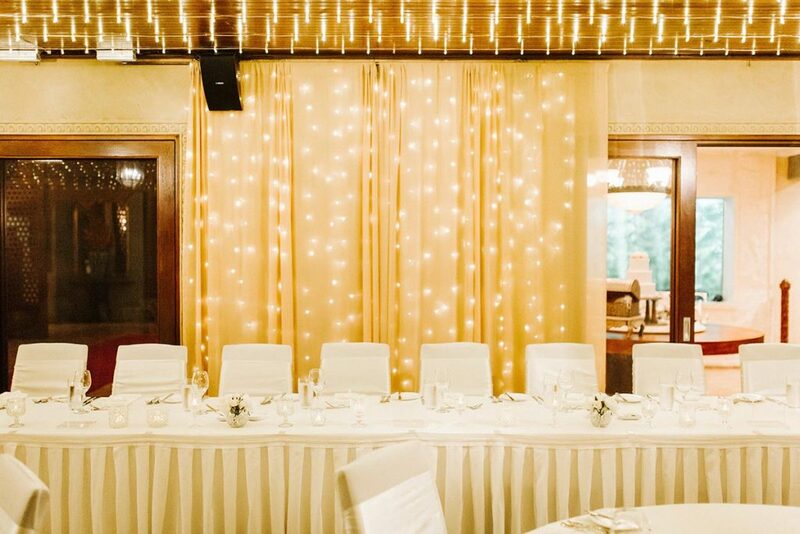 Where a bridal table is set by the waterside, we recommend a backdrop of cascading lighting. 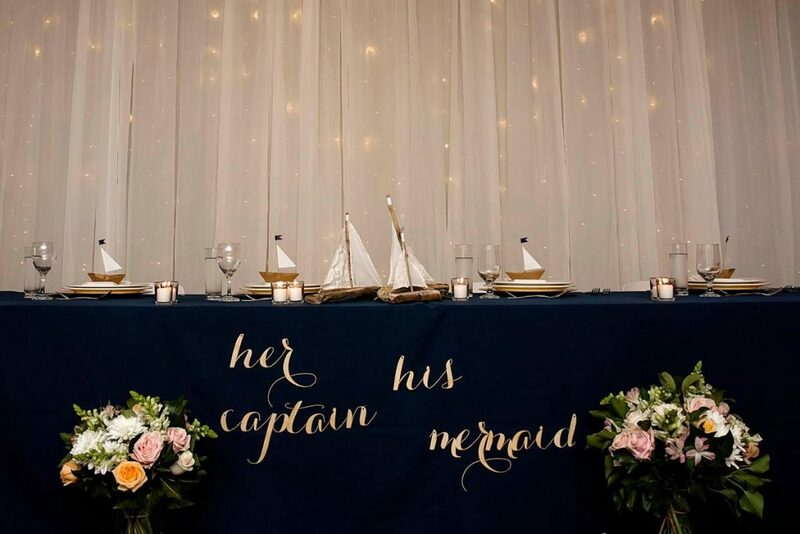 It adds light and also anchors the bridal table to the surrounding setting. Cascading lights makes for beautiful feature and backdrop photos once the sun has set. Adding large potted plants entwined with lights also enhances features and adds to the ambience and surrounds of a reception venue. Plants enhance corners, fill gaps and hide posts and walls and provide a natural indoor or outdoor feature to the reception. Country and outdoor weddings offer plenty of space. Incorporate relaxed seating areas to include ottomans, couches and coffee tables. 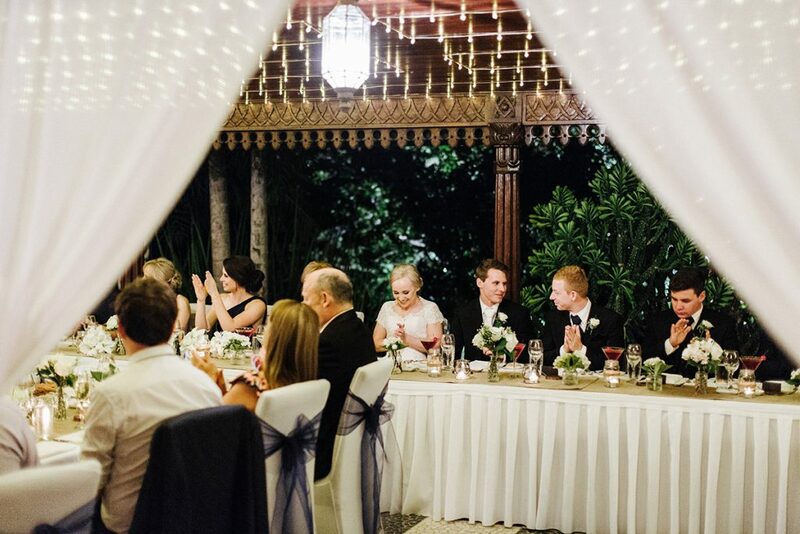 Set up areas where you and your guests can retreat to mingle, unwind and relax and take a breather between dances whilst enjoying the night air under twinkling stars. Rugs, mats, cable reel tables and stools along with chilled out picnic areas styled with an eclectic mix of cushions also make for wonderful relaxed seating areas. Use all of you available space! For table seating choose styling elements that reflect the natural surrounds such as wooden tables and chairs for you and your guests. 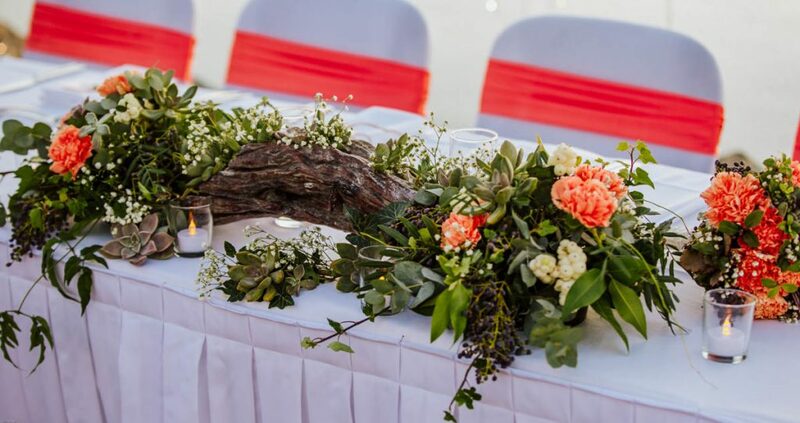 Lush foliage works well on wooden tables in keeping with the natural look. Choose natives for your foliage, a variety of gum leaves and trailing varieties. For florals, proteas are striking. Red, pinks and purple florals work well with boho and rustic décor styles. Large lit balloons or large lanterns also add features and lighting elements around a lawn, filling dark spaces. 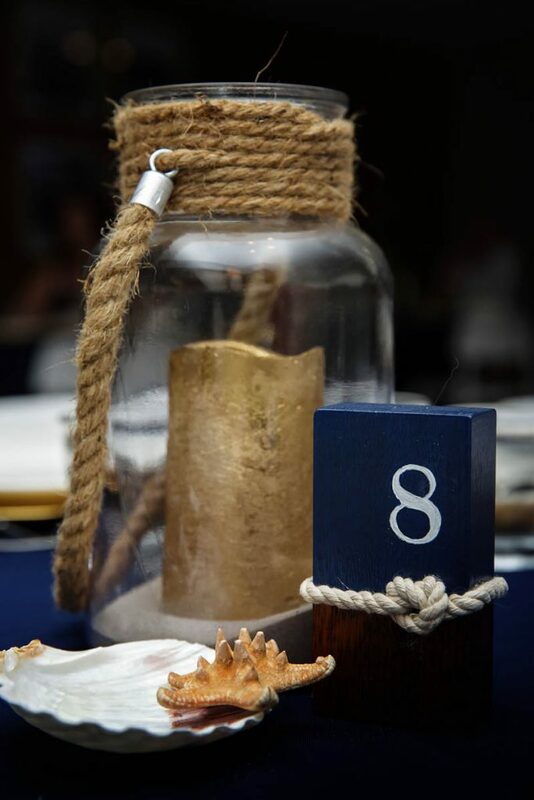 For beachside wedding receptions beach inspired centrepieces are timeless in this region. When choosing a beach inspired centrepiece I would recommend natural elements and colours. White elements such as white wooden lanterns or natural pieces such as stones and driftwood provide key features. 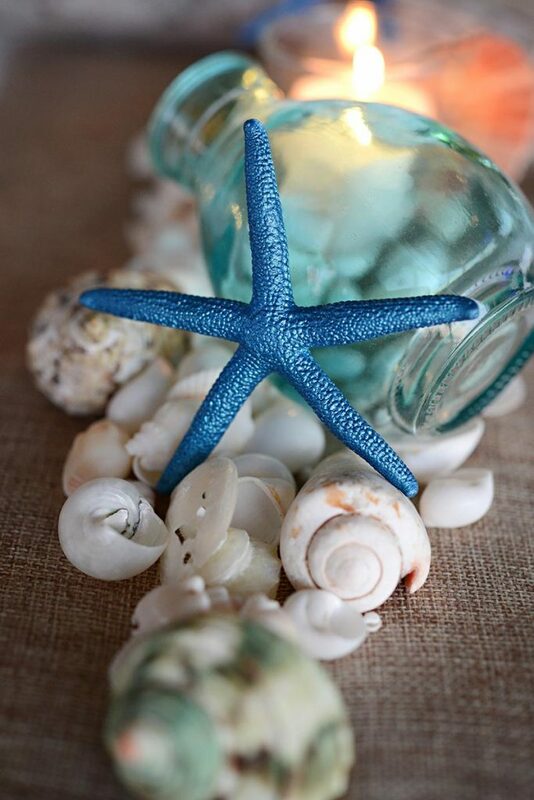 Aqua candles, marine blue vases or polished ornate shells can add that splash of colour against the natural tones. I would not however recommend sand. There is plenty of it on the beach, you don’t need it on your tables. 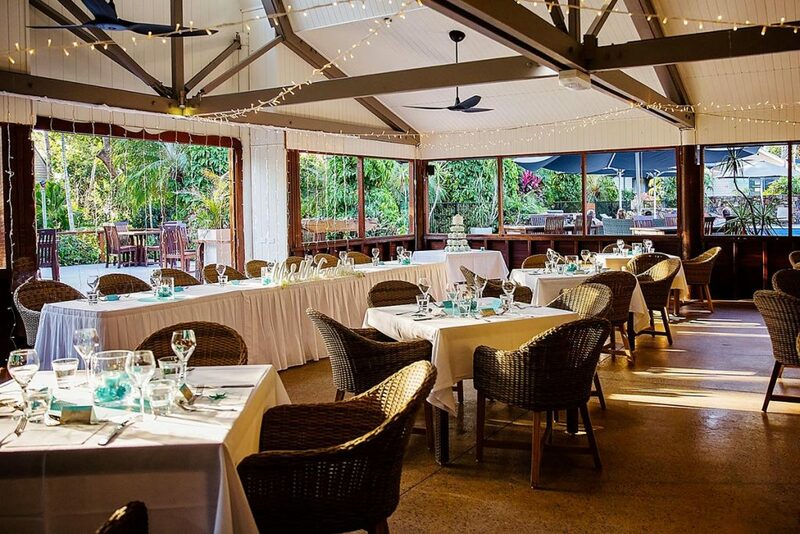 Pavilions and wooden beams of verandahs and decks at beachside venues can be enhanced with chiffon, floral and foliage drapings to add texture and feature. Your decision on how you would like the layout of your tables and chairs can impact the number of tables required and therefore the number of decorative pieces for your tables. Choosing formal or casual seating, and how you would like your family and guests to interact, determines your table layout and therefore the style and amount of your table décor styling. For close seating choose low decorative pieces where guests can talk over their meal. For larger function rooms with large round tables, opt for table décor a little more extravagant. Choose tall pieces, mirrors, glass and crystal pieces or large foliage statement pieces. Whilst lush and large centrepieces can make for beautiful statement pieces these are not practical if you are serving shared platters or a banquet menu where large plates of food are to be placed on the table. Space is required on the tables and in this instance centrepieces will quite often be required to be moved. You may wish to consider smaller simple centrepieces or lanterns that can be spaced out on trestle tables for easy placement of the platters. If you prefer a more relaxed style of reception and are considering more of a cocktail or grazing style function then less seating and tables may be required. Where smaller tables and relaxed options such as dry bars are being used they can also be styled with smaller simpler decorative elements. Where tables are required to be clothed ensure that you use professional quality heavy-duty linen. 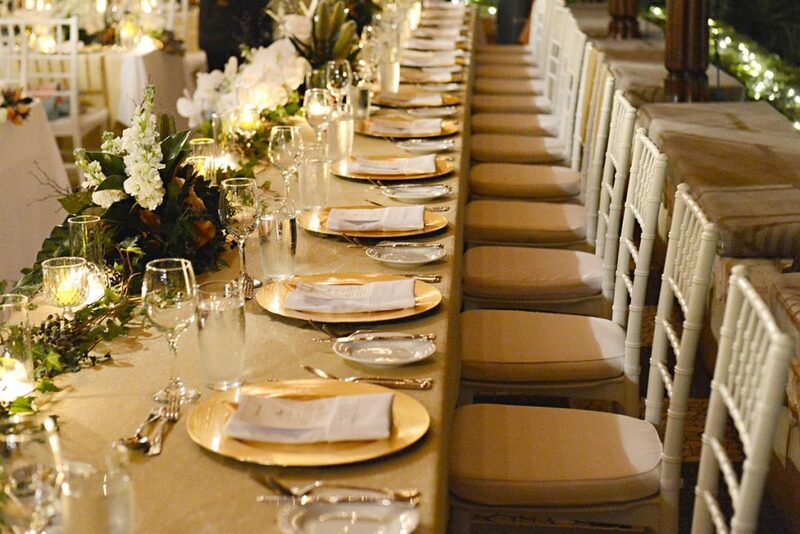 Quality table linens can be arranged through most venues or your stylist. Quality linens along with quality linen napkins provide a wonderful crisp clean white solid base on which you can add colours and textures. They also look and feel professional and instantly change the feel of the tables and venue. 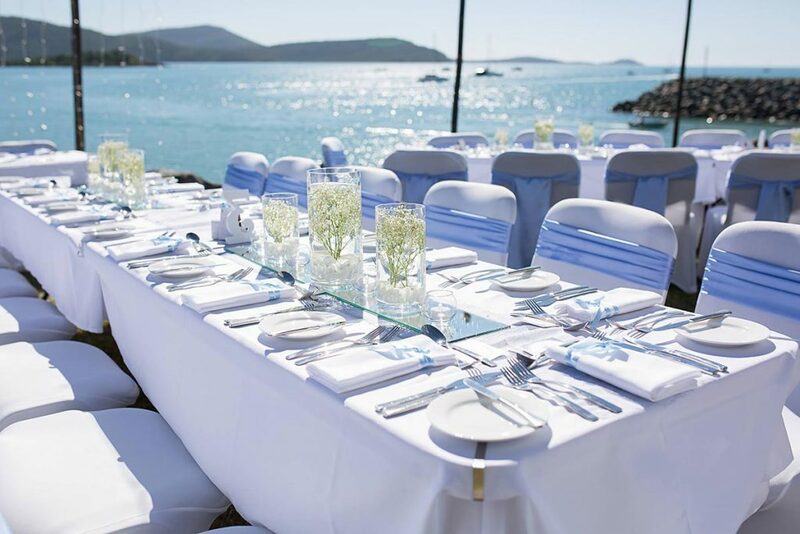 At outdoor weddings, heavy-duty linens are a must as they sit more firmly, can be easily secured and do not slide or blow off as easily in sea breezes as do cheaper lightweight linens. Your décor will certainly sit and look more beautifully presented on crisp quality linen. Keep your colour theming consistent. Ensure your chosen colours blend and compliment one another. When choosing décor styling for your venue, use your chosen bridal party colours to complement the main colour features in your décor such as chair sashes, table runners and main colour features in your centrepieces. For accompanying décor such as the finer details in your chosen centrepieces, wishing wells and finer decorative elements, choose florals, foliage and colours that complement your bridal bouquet. We can’t stress this enough! Invest in a stylist for your wedding. Don’t put pressure on friends and family to decorate your venue. They want to enjoy your special day with you too. Quite often panic ensues as they are not sure what to do, where to put things and then have to rush off and get ready. It can take many hours preparation and planning to set up a venue and style the tables exactly how you would like them. By enlisting the services of a stylist they will ensure not only is your reception styled to your liking and to perfection; it will also be packed down for you afterwards. Leaving you and all your family and friends simply to turn up, relax and enjoy. 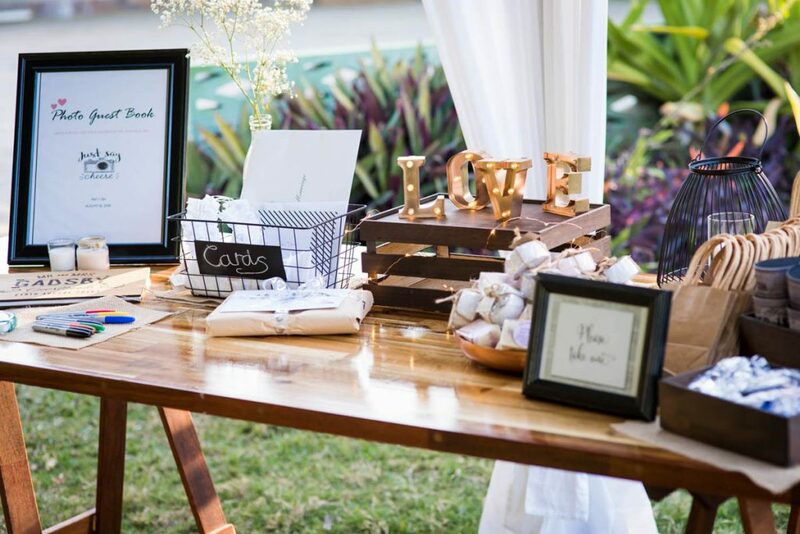 Whatever type of venue or style you choose, do add your own personal touches. Choose styling and décor items that reflect you both as a couple. You may also wish to add you own personal items. Talk to your stylist on how you can incorporate these into your wedding or table displays. It could be something simple as welcome photo board, a family heirloom, a personalised sign, decorative items or a particular choice of gifting or wishing well idea. Each couple and wedding is unique and so are your tastes. Enjoy your wedding the way you wish. Whatever you choose your stylist is here to guide you and will have your wedding reception looking amazing on the day!